Look, nothing justifies what Square Enix did. Setting up a weekly countdown that everyone giddily expects will be a sequel to beloved DS game The World Ends With You only to reveal that it's actually a $20 iOS port? Indefensible. But I bought the iPad port of The World Ends With You today, and after roaming around Shibuya for the past hour or so, I must say: it's actually a pretty good port. The first thing you should know about this version is that combat is totally different. On the DS, you could control characters on two screens: you'd use your stylus to guide around protagonist Neku on the bottom touchpad while pressing directional buttons to move your partner on the top screen. The key to defeating enemies was to master this simultaneous input. It was confusing, challenging, and lots of fun. Obviously this would never work for the iPad (and iPhone). It only has one screen. So instead of controlling your partner on a separate background, you use her like one of the psychic pins that trigger your abilities. You have to use your partner's abilities concurrently with your own. For example, you might tap on an enemy to summon your partner's lightning bolts while simultaneously swiping the ground near that enemy to conjure up walls of fire. You can alternate these attacks to do bonus damage to opponents. The touch screen controls work well, and in many ways The World Ends With You feels more suited to this platform than it ever did to the DS. The bigger iPad screen does justice to the crowded streets (and minds) of Shibuya, and battles take place on wider, more interesting planes than they did on the original. Everything looks and sounds great. 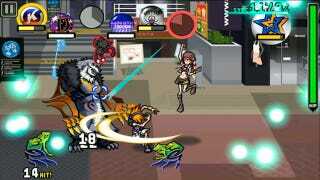 So is The World Ends With You: Solo Remix worth $20? Hard to say. Even worse than Square Enix's inflated prices is the fact that there are separate apps for the iPad and iPhone versions: if you want to play the game on both devices, you'll have to buy it twice (just like most of Square Enix's iOS releases). Again, indefensible. But at least it's a good port.